Gallery / Saga Press, 9781481451864, 656pp. Two men rebel together against tyranny—and then become rivals—in this first sweeping book of an epic fantasy series from Ken Liu, recipient of Hugo, Nebula, and World Fantasy awards. “A magnificent fantasy epic” (NPR). Fans of intrigue, intimate plots, and fast-paced action will find a new series to embrace in the Dandelion Dynasty. 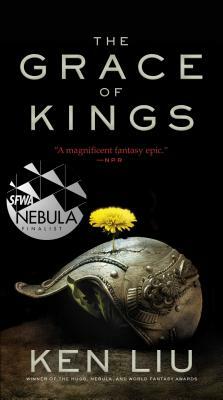 "Ken Liu's The Grace of Kings — a magnificent fantasy epic. Liu is building a dynasty." "The Grace of Kings is an ambitious, astonishing, and sublime work, one that both exemplifies and diverges from what one might think of when it comes to epic fantasy. It should rank amongst the genre's best works." "Liu’s combination of elements from China, Polynesia and beyond, told in an epic style, is the kind of Silk Road Fantasy that I’ve always wanted to read, and love all the more now that I have." "Told in Liu’s graceful, intelligent, and literate prose, the novel is a sumptuous Epic feast." "The Grace of Kings is a fantasy, with petty meddling gods, odd mechanized inventions, and a sense that mystical powers lurk around the corner. It is nothing if not epic." "The epic fantasy genre can only be enriched by more novels drawing from non-Western traditions. Liu’s ambitious work expertly blends mythology, history, military tactics, and technological innovation (airships and submarines). " "The Grace of Kings is grand, mythic and epic, but Liu’s “silk-punk” world of trickster gods and giant horned whales is also a delight."